The hammock tent comes handy during a camping adventure. It enables you to relax comfortably while enjoying nature or to rejuvenate your body and mind after a long trek or hunting expedition. If not sleeping on it, you may choose to just take a nap, either by yourself or with your partner or spouse. But which is the best? Answering this question isn’t easy considering that you have hundreds of products to choose from. What’s more confusing is that many look just same in regards to material, color size, weight and much more. 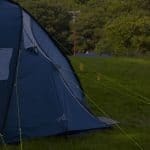 After carefully reviewing the available products, we now present the top 8 hammock tents in the market. Also, we will give you tips on selecting a product and safety tips. 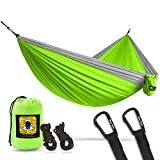 XL Double Camping Hammock - Heavy Duty and Ultralight Nylon Travel Hammock - Upgraded Carabiners Portable Hammock with Tree Straps – Indoor & Backyard Hammock –Easy Setup Hammock - Holds 500 lbs! Finding the right hammock tent shouldn’t be a struggle. What you deserve is this product from Everest Active Gear. The 2-person hammock comes in innovative design and offers a decent place for napping, sleeping, or/ and relaxing. It’s crafted using tough 210Tnylon that can put-up with the stretching, regular washing, and the elements. It’s coated with polyurethane for extra sturdiness and beauty. In addition to that, consumers love the simple design and easy setup and also the good breathability. According to the company, this tent can safety handles up to 400 lbs. The Durable Water Repellent (DWR) finish keeps you dry and also protects the hammock from the water. 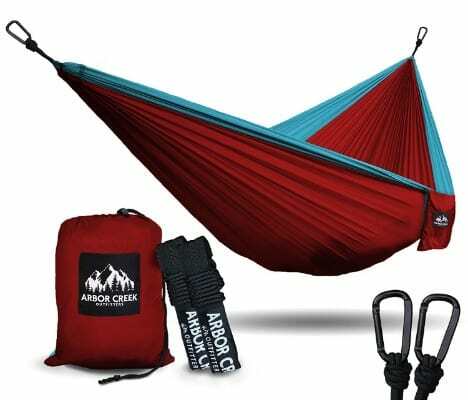 Your search for a reliable and durable hammock tent ends after you acquire this unit. Like other types, it is appropriate for indoor and outdoor use and can be used for hiking, camping, travel, mountaineering, and the beach. The high fiber 210T parachute nylon together with the ultralight 7075 aviation aluminum carabiners can support up to 450lbs (205kg). Additionally, it has a breathable fabric for a sweat-free environment and is designed for a maximum of 2 people. And to stop mosquitoes from gaining entry, it comes with a mosquito net. The machine washable unit is easy to clean and also dries fairly fast. 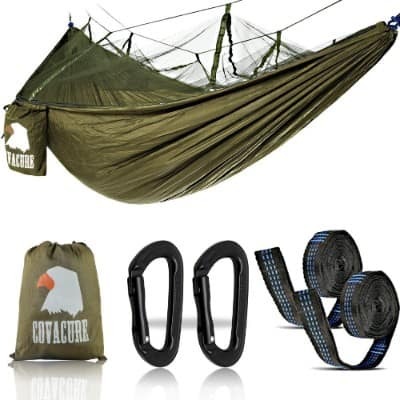 The Covacure Camping Hammock measures 8ft 9inches/230cm Long and is 2.8ft 33.5in/85cm wide. It can comfortably and safely handle up to 440 pounds and is ideal for indoor and outdoor use. The lightweight item weighs 6.9oz/480g and won’t slow you down while hiking, trekking, camping, beach, or hunting. It comprises 210T ny6lon that has been triple stitched to prevent ripping or tearing. What’s more, the professional looking piece has a nice pattern that gives it beauty and a mosquito net to keep the annoying insects at bay. 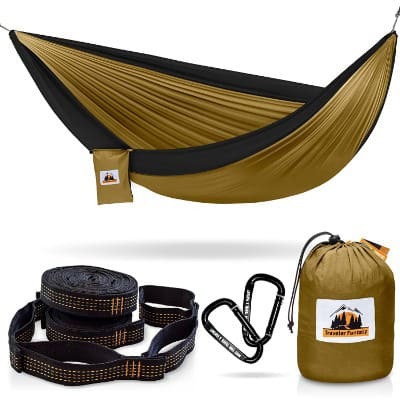 The strong carabiners and straps secure the hammock on trees and won’t come loose or tear easily. It features breathable material for comfort and good breathability. 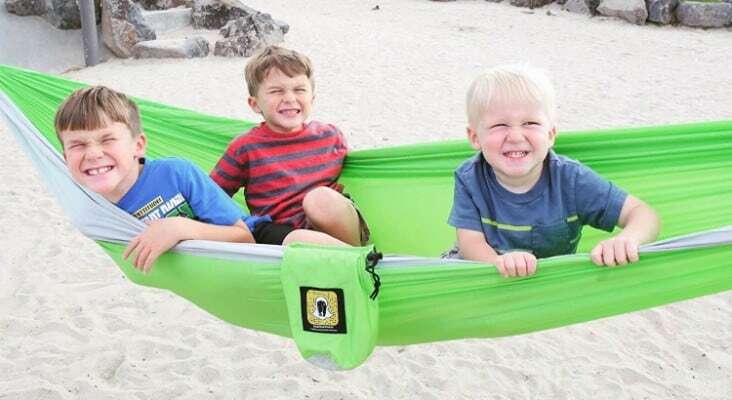 Available in a Maroon / Baby Blue color, this camping hammock gives you a nice resting place. It can handle up to 500 pounds of weight courtesy of the heavy duty parachute nylon fabric. And although it’s tough, the material is ultra lightweight, and this improves carrying ease. The spacious item can cater for two mature people with no problems. It has triple interlocking stitching and aluminum carabiners for extra strength. Also, the breathable material prevents sweating and a stuffy environment and feels nice and smooth even on bare skin. Setting the unit takes a short time and stays firm thanks to the rustproof stainless steel snap links. It weighs 1.5 pounds and is right for boating, camping, traveling, hiking, boating and more. 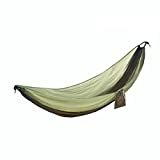 This hammock will look great in your backyard, at the camping site, along with the beach, jungle and many other places. The compact unit measures 4″x 7″x 9″ (10cm x 18cm x 23cm) when open and has a Hunter Green color plus black trim and should look nice in most settings. The bottom section is created from a firmly woven 70D nylon fabric and can handle up to 250 pounds (114 kg). 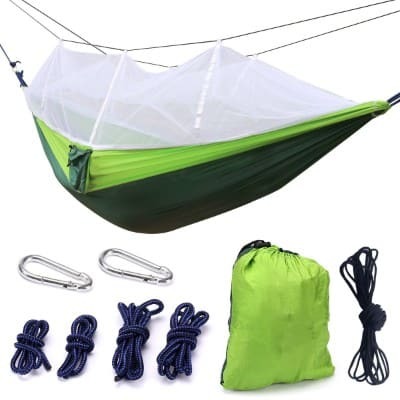 Furthermore, it is also ideal for people as tall as 6 feet and comes with a 30D no-see-um mesh for stopping mosquitoes and other bugs. The lightweight piece sets up easily and doesn’t stretch or sag too much. The test polyester ropes can support 1500lb (680kg) while the 70D polyester RipStop tarp improves functionality. The outdoors will be more satisfying when lying or sleeping in this hammock. It comers in army-grade and you can be confident that it will last a long time. The tough parachute nylon fabric can resist ripping, tear, wear and fading. 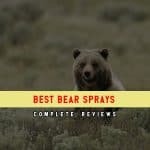 It is multifunctional and great for hiking, camping, boating, hunting, chilling out inside, backpacking, and relaxing in the back-yard and more. 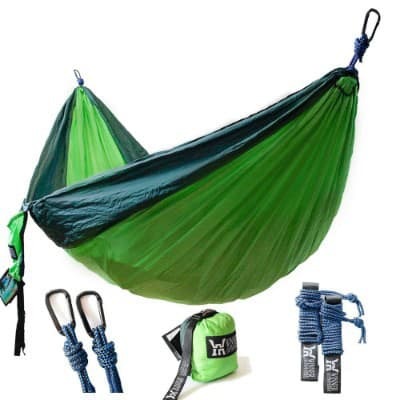 Besides that, the double hammock is designed for two people and has long ropes for easy tying on a tree, poles, and frames. Choosing the right height and length is as easy as loosening or tightening the 2 adjustable straps. The 2 high-tensile carabiners offer extra stability and safety and the fabric is triple stitched for ultra durability. Carrying it is not an issue thanks to its lightweight. This camping hammock tent will be up and ready for use in less than 3 minutes. It’s not only simple but also doesn’t require any stand. All you need is securing the end tropes to a sturdy tree or post. The lime green/gray tent is crafted from durable parachute nylon and is fit for the weekend trip, backpacking expedition, and traveling. It’s lightweight, weighing just 1.5 lbs, and collapses to a small size for easy fitting inside the carry sack or backpack. Moreover, the 75D Nylon Taffeta material and reinforced nylon end straps are designed for a maximum weight of 500 pounds. Also included are two 10ft long tactical grade ropes and 2 heavy-duty carabiners. 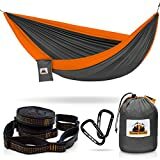 The crown for the best hammock tents goes to the Winner Outfitters Double Camping Hammock. It is suitable for the campsite, beach, backyard travel and many other locations. The lightweight piece has a dimension of 118(L) x 78(W) inches and is suitable for two people. It’s made of 210T parachute nylon, which is its lightweight and strength. According to the maker, this unit can handle up to 500 pounds. 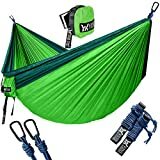 In addition, it has two tree friendly straps each measuring 52 inches long and 1 inch wide and two solid steel carabiners. It’s easy to set up and will work with different t trees quite well. 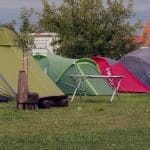 You only need about 3 minutes to secure the camping accessory properly. And courtesy of the Dark Green/Green color, it blends well with nature. Size: You will get hammocks for a single person or a couple. They will also have different capacities to handle different weights. The manufacturer always states the maximum recommended load, and it’s vital that you don’t go beyond it. It’s advised to allow a margin to stay safe. However, the larger it is, the more space it will occupy, and this may affect its portability. Material: The item is made from different materials, and we know each will have its advantages and downsides. For instance, nylon is lightweight and smooth but not super strong. Polyester can be quite strong but isn’t as light as nylon. Cotton is known for its comfort and strength but may be a little expensive and weighty. Portability: Like other camping gear, you will constantly move with your hammock tent. It’s easier and more convenient to carry a light unit compared to a heavy or bulky one. Other than the material being light, a portability product will fold to a very small size and will fit inside a bag or sack. Weight: The accessory is rated depending on the weight it can handle. Hammocks for 2 people have a higher load capacity than a single-person hammock. Normally the earlier one will handle 400 plus pounds while the latter is normally 250 pounds or below. Strap Compatibility: Although most hammocks come with their own straps, you still need to confirm that it will also work with other types. This is because they may break or become ineffective after long-term use. A good product can be used with other straps and will still be strong, firm and comfortable. Also important is checking the kind of suspension it uses. In seeking relaxation and comfort, many people have been injured by the item. They may have fallen down, had their foot or arm entangled inside the ropes, or the skin scratched/chaffed by the fabric. It’s also common to hear about a tree or branch falling on the user. You can avoid such things by observing the following. Why would you go for a 150pound hammock for kids yet you weigh close to 180 pounds? Why would two adults try to squeeze themselves in a one-person unit? You should use a product that is suitable for the need at hand. 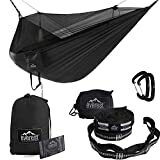 Single –person hammock is for one person and also ensures your weight or combined weight is less than the recommended one. It’s vital that you learn how to tie the hammock. Using a wrong knot will make the item come loose during use, and you may fall down. The kind of straps harnesses and points of holding influence the mode of tying it. Yes, you may tie it properly, and it will be firm and steady. However, you may come crashing to the ground if the tree or pole breaks. Before tying the hammock tent, you should be double sure that the tree, pole, post or frame can handle the weight and is very strong. Lying or sitting on the hammock in a wrong position is not only uncomfortable but may also cause injury. 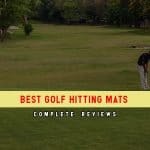 Arching the back, straining the neck, sleeping in an awkward position are some symptoms that show the pitch isn’t quite right. You need to confirm that it is level and the supporting points don’t sag when you lie on it. You should have tried tying the hammock several times before you head to the park or camping zone. Test the unit and skills from your backyard or the local park. Tie it at a lower position and see how well it handles. In case of difficulties, re-read the included instructions, seek help from experienced users. 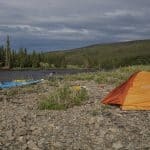 Finding the best hammock tent for you or your partner doesn’t need to take too much time or effort. You shouldn’t base the decision on unfounded or limited information. Also, you shouldn’t keep replacing the product due to poor quality. 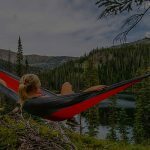 By choosing any of these hammock tents, you are sure of reliability, maximum comfort, effectiveness, safety, durability, affordability and most importantly, peace-of-mind. To settle on the items, we focused on the critical aspect which includes size, weight, capacity, material, design, setting up ease, maintenance, and price among other things. Therefore, your camping experience will be but a memorable one.